WASHINGTON — Citing North Korea's growing nuclear and ballistic missile threat, the Trump administration is moving to vastly expand the problem-plagued homeland missile defense system despite warnings that the planned upgrades may not succeed. Immediate plans call for building two $1 billion radar installations and adding 20 rocket interceptors to the 44 already deployed in underground silos at Fort Greely in Alaska and Vandenberg Air Force Base in California. The Pentagon also is taking steps to launch new satellites to help each interceptor's "kill vehicle" find, crash into and destroy incoming ballistic missiles high above the atmosphere. The expected cost is about $10.2 billion over five years, on top of more than $40 billion already spent for the system. On Thursday, Congress passed a short-term government funding bill that includes $200 million to start preparing construction of additional missile silos in Alaska. But government reports and interviews with technical experts suggest the planned upgrades, including a redesigned kill vehicle, are unlikely to protect the United States from a limited-scale ballistic missile attack, the system's stated mission. One concern is the administration's rush to expand the system. The first new radar is scheduled to be made operational in 2020 before any flight testing is conducted. And the first set of redesigned kill vehicles will be installed in late 2021 _ following just one flight test of a prototype. All the new interceptors and kill vehicles are supposed to be in place by the end of 2023. "There's no way to prove out the design — let alone its reliability — without more flight tests," said L. David Montague, a former aerospace executive who co-chaired a National Academy of Sciences panel of 16 experts that recommended ways to improve U.S. missile defenses in 2012. "It's stupid." On Oct. 11, President Donald Trump told Fox News that the interceptors "can knock out a missile in the air 97 percent of the time." The interceptors have only a 50 percent success rate in controlled flight tests, according to Pentagon reports. The stakes are high because North Korea has developed an arsenal of nuclear weapons and last month tested an intercontinental ballistic missile that American officials said appeared capable of reaching the entire United States. Some experts fear that U.S. overconfidence in the missile defense system could lead to miscalculations in the standoff with Pyongyang. "The response to North Korea is, 'Let's spend billions of dollars more on missile defense,' " said Laura Grego, a physicist who led a 2016 study of the anti-missile system for the nonpartisan Union of Concerned Scientists. "But we ought to be very careful that we're not fooling ourselves." The Missile Defense Agency, the Pentagon division responsible for protecting the nation from a limited ballistic missile attack, did not respond to questions for this article. Pentagon officials have told Congress that they have confidence in the system _ but that it needs improvements. In April 2016, Vice Adm. James D. Syring, then head of the missile agency, told a Senate subcommittee that he wanted to "replace the less reliable kill vehicles." More details about the system's upgrades, and their expected costs, are anticipated early next year when the administration completes its Ballistic Missile Defense Review, a document aimed at setting policy and priorities. Even more ambitious missile defense projects may be on the way. On Dec. 12, Trump signed a defense authorization bill that requires the missile agency to develop plans to ultimately deploy 104 interceptors — perhaps by building new missile silos in the Midwest or on the East Coast. The agency also is preparing options to deploy space-based laser weapons for missile defense. The interceptors form the core of the existing Ground-based Midcourse Defense system, or GMD. It is designed to track and destroy a limited number of incoming missiles from North Korea, Iran or another nonsuperpower adversary _ not the kind of cataclysmic nuclear exchange envisioned in the Cold War. The first few interceptors were made operational in 2004, but the GMD system has been beset with multiple shortcomings. Since flight testing started, interceptors — often launched from Vandenberg, in Santa Barbara County — have failed to destroy target missiles in nine of 18 attempts. Since 2004, the system has failed in six of 10 of the flight tests. 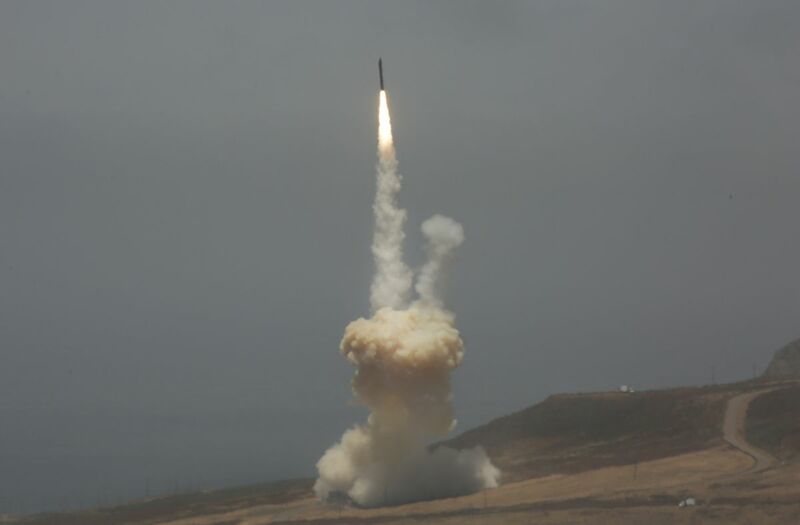 Pentagon officials, including two former directors of the Missile Defense Agency, have attributed the problems to shortcuts taken during the development and deployment of GMD. Military planners estimate that four or five interceptors would be needed for each incoming missile to ensure its destruction. A dozen nuclear-tipped missiles thus could overwhelm the current U.S. arsenal. The system's inadequacies have been described by the Pentagon's operational test office as well as the U.S. Government Accountability Office, the National Academy of Sciences panel and in interviews with other defense specialists. For instance, 34 of the 44 existing interceptors use circuit boards that flight testing suggested are vulnerable to electrical shorting. The boards are crucial for powering the rocket thrusters that help steer the 5-foot-long kill vehicles toward their targets. A Missile Defense Agency spokesman, Christopher Johnson, told the Tribune Washington Bureau/Los Angeles Times in an email last February that "improved manufacturing processes" would upgrade circuit boards in new interceptors, but that "no corrective actions" would be taken for the original 34. Moreover, U.S. officials have no reliable way to know whether an interceptor has hit and destroyed an incoming warhead and not just a decoy or large rocket debris. The so-called kill assessment is vital to ensure that interceptors are not squandered during an attack. "You don't want to keep shooting at something that's already dead because you need your ammunition for things that aren't dead yet," said Philip E. Coyle III, a missile defense expert who headed Pentagon weapons testing and evaluation from 1994 to 2001. Each of the new missile defense projects faces significant technical obstacles. Every new interceptor will have a redesigned kill vehicle at its tip. If they are launched, the kill vehicle is supposed to separate from the three-stage rocket and, aided by an onboard sensor and rocket thrusters, slam into the target at a speed of 4 miles per second. Because of weightlessness in space, that's much faster than a speeding bullet on Earth. Although missile agency officials say the new kill vehicle will perform more reliably than earlier versions, some outside experts are skeptical. The Government Accountability Office, or GAO, which investigates federal programs for Congress, reported on May 30 that a heat-seeking sensor designed for the kill vehicle "may not have sufficient performance to defeat some intercontinental ballistic missile threats." The 117-page report said several Defense Department units, including Strategic Command, "have raised concerns" about the sensor's ability to detect and track enemy missiles. The missile agency plans only one flight test of the redesigned kill vehicle before deploying the first set of new interceptors, however. That commits the Pentagon "to buying a product prior to demonstrating the system is operationally useful," according to the GAO. The new radars also have come under scrutiny. They are supposed to be able to distinguish an enemy warhead from decoys or rocket debris. The National Academy panel and other experts cited the existing system's inability to do so as a major concern. The missile agency aims to solve or mitigate the problem by installing new radars — each costing about $1 billion — at Clear Air Force Station in central Alaska, and at a site not yet announced in Hawaii. Both radars will operate in the "S-band" radio frequency, a mode used by the Navy to track short- and intermediate-range ballistic missiles. In interviews, several outside experts questioned whether the S-band can adequately identify long-range missiles and said the Pentagon should instead use more powerful "X-band" radars. David K. Barton, a radar engineer who served on the National Academy panel, said X-band's shorter wavelength enables it to provide better-magnified detail, or resolution, of potential targets. "Inherently, the resolution at X-band is three times as good as that at S-band," said Barton, who has advised U.S. intelligence agencies. "The higher the resolution, the better your results." Cristina Chaplain, lead author of the GAO report, said her staff learned that the missile agency chose S-band over X-band in an effort to reduce costs. The GAO report also noted the missile agency intends to deploy the new radar in Alaska before it is used in a single flight test. The Pentagon thus will "risk that there may be unknown and unmitigated capability gaps in the fielded system," the report said. The new satellites pose another challenge. Over the decades, the Pentagon has repeatedly sought a space-based system to distinguish warheads from decoys. Most recently, the Obama administration spent $231 million to develop what was called the Precision Tracking Space System. It was never deployed. The Trump administration is backing a rebranded approach, called Persistent Space-Based Sensor Architecture. It ultimately could send numerous new satellites into space. How many satellites to deploy has not been determined. Outside experts estimate at least 24 would be needed — at an additional cost of tens of billions of dollars — to provide continuous monitoring and guidance for the kill vehicles during a potential missile attack from North Korea. Montague, who co-chaired the National Academy panel, said the latest satellite initiative faces the same obstacles that its predecessors failed to solve. "It's very difficult for me to see how such a scheme would work," he said.